Sultan Kosen is currently the tallest living person in the world and the sixth tallest person who ever lived. Just like some others on this list, Kosen’s height is due to a pituitary gland tumour. However, unlike others, his growth was successfully stopped by doctors in 2012 following the removal of the tumour affecting his pituitary gland. Sultan first became the world’s tallest living man in 2009, when he measured 246.5 cm (8 ft 1 in) in height. Sultan was never able to finish school because of his extreme height but works occasionally as a farmer to support his family. He describes one of the advantages of being tall as being able to help his mum out with jobs such as changing a broken light bulb and hanging curtains. Disadvantages to his height he said to include not being able to find clothes or shoes that fit or finding it extremely hard to fit into a regular size car. Like every other normal human being, Kosen said he would love to get married and have a family of his own, have a good collection of outfits and as well be happy. Brahim Takioullah is currently the second tallest living person in the world and 10th tallest man that ever lived. He was born in Morocco in 1982. His height is linked to a growth abnormality known as acromegaly. He is also listed in the Guinness World Book of Record as the man with the largest feet on earth (and the second man with the largest feet that ever lived after late Robert Wadlow), with his left foot measuring 1ft 3in (38.1 cm) in length, and his right measuring 1ft 2.76. 33-year-old Takioullah lives in Paris and cannot stand up straight in the small flat he shares with his mother. He has difficulty getting into a taxi or the Metro, and can never move around without attracting attention. But he is surprisingly good humoured about his condition, ever ready to smile and pose for mobile phone snaps and politely answering questions about his condition, expressing his hopes of curing his problem through a surgery. Just like Morocco’s Brahim Takioullah, Morteza’s problem is that of acromegaly. He was born in 1987 and lives in Chalos in the north of Iran. His unusual growth started at the age of 16, when he was 190 cm tall and fell off his bicycle and injured his pelvis. His right leg had stopped growing at that time. His right leg is about 15 cm shorter than his left leg while his hand was measured at 27 cm long. He is currently the tallest man in Iran with a full stretched height of 8 ft and an inch. Zhang Juncai is the tallest living Chinese and the 4th tallest living man on earth with a height of 242 cm. Juncai is from Shanxi Province, China. He was verified as China’s tallest man on 23 November 2004. He stands 6 cm (2.4 in) taller than Bao Xishun, 10 cm (3.9 in) shorter than Sultan Kösen and 72 cm (28 in) taller than the average Chinese man. Radhouane Charbib belongs to Tunisia and was born on 27th October 1968. 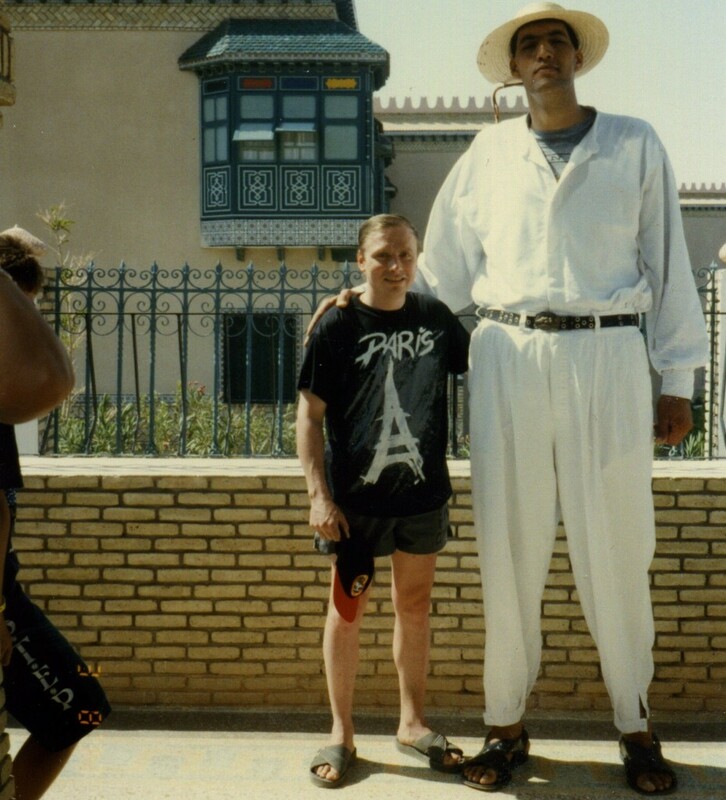 Radhouane Charbib was once the tallest man in the world and got his name listed in the Guinness Book of World Records. Radhouane Charbib realized at the age of 15 that he is growing pretty faster than any normal human being and at that time he was already 5 feet and 7.4 inches tall. According to Radhouane Charbib, he is very much happy with his height and says that it’s a special gift and he feels very happy when he walks along the street and people stare at him with eyes and mouths wide open. Sun Ming Ming belongs to the Bayan county, Harbin, Heilongjiang province of China and was born on 23rd August 1983. Sun Ming Ming is a professional basketball player and is considered as one of the tallest men who ever played basketball professionally for a long period of time. The measured height of Sun Ming Ming is 7 feet and 9 inches which makes him the 6th tallest man alive. Rafael França do Nascimento hails from Duque de Caxias, Rio de Janeiro, Brazil. He was born in 1987 and currently measures 7 feet 8.5 inches in height and is still growing. Nikolai Pankratov is the tallest man in Russia since 2014, when he underwent surgery to his knees in the Kurgan Ilizarov Scientific Center. Igor Vovkovinskiy is from Ukraine but moved to Rochester, Minnesota for his treatment. One of the most astonishing things which you will come to know is that Igor Vovkovinskiy was more than 6 feet tall at the age of just 7 and weighed 200 pounds. This huge giant also has the honour of being called one of the biggest supporters of Barrack Obama. According to Igor, it sometimes gets very difficult to manage things because of his huge height. The measured height of this tall guy is 7 feet and 8.33 inches which makes him the 9th tallest living person in the world. He is currently the tallest person living in the United States. Most recently, he has been acting in commercials and movies. Igor has become well known for wearing a t-shirt that read “Obama’s Biggest Supporter”. He took part in the Eurovision Song Contest 2013 in Malmo, Sweden, as one of the performers on the stage representing Ukraine. Brenden Adams (born September 20, 1995, in Ellensburg, Washington) holds the record for being the tallest teenager in the world and as of 2014, the tenth tallest person alive. His father, Willie Adams, and mother, Debbie Ezell, first observed his extreme height condition when he was two months old. The condition is caused by a disorder with the 12th chromosome.